Indulge me. I like RZA’s The Man with the Iron Fists only because it falls under the terms in which any rubbish can be transformed into a gem, somewhat, at least in my purview. Not because it satisfies today’s latent thirst for gore, going through great lengths to turn it into kitsch, thus finally dispelling all arguments that Kill Bill or ─ wait for it ─ even Battle Royale holds our attention as long as there’s blood magnificently gushing forth from severed arms and heads; nor because it comes off from the same team (Tarantino, Roth) that brought us the fantasy production called Inglourious Basterds, something that can now be safely tucked away for its earnestness – you want revenge, we know, it’s funny, ha-ha – but simply because The Man with the Iron Fists deploys all possible cinematic techniques that will make you want to hate it for you to love it. I like things that, from the outset shouts, “Hey, love me!”; spectacles, we are taught to assume, operate within this parameter but it’s actually quite the contrary: for a spectacle to work, you must not care about it all the way (a fireworks display for example is just that, a spurt after the glow and nothing follows) or else you’re not going to ask for more. 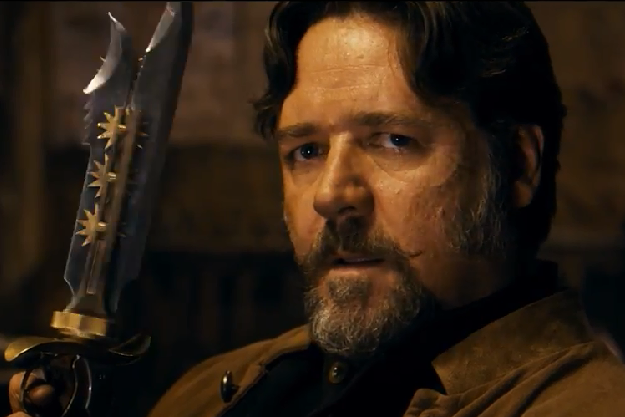 Russell Crowe: The alpha male's alpha male. Where Inglourious Basterds fails to be what it portends not to be, i.e., not a spectacle (hello, Christoph Waltz) which in hindsight is, The Man with the Iron Fists, despite its literal gut-wrenching opening, its profuse and therefore almost uncaring use of physics-bending choreography from Hong Kong’s martial arts cinema – uncaring because it’s not doing any sort of homage but wants to readily claim it by way of typification (this must be how all “Asians” do their chores, flying and fighting) – and notwithstanding its insistence on not making any discernible statement whatsoever, a point I will get to in a bit, stays true to its form: incoherent to the point of absurdity and trite to a degree that you will and can, gasp!, care about what will become of these thinly realized characters. It is this very same faculty that relegated the B-movies of yore in its place, a piece of cheap thrill. But RZA’s trick is by no means cheap; whereas in the 70s-and 80s’ bad dubbing, bad editing, and bad acting, we are, as per its cost, given its slicker, more acceptable version, the one that will get you off your CG-rocks. Consequently, I glean this only as a distraction and it works only if it goes hand-in-hand with something quite inane as The Man with the Iron Fists and this inanity is the very reason why it falls short to being a spectacle. Four clans fight over an obscure town riddled with vice, all these seen through the eyes of a blacksmith, which is a pun as you will see, and by exposition, we go through the tedious motions of how everything, and by everything I mean the showdown at the end, was set into motion when the governor of the province asked for the Lion Clan to safeguard his gold which was to pass through the town of Jungle Village. What we have seems to be a piece of studio-borne lore, but as the film progresses, this seemingly conflated, made-up tale turns into a bit of local history; it just doesn’t make sense! Yes, all the clan leaders look like Lions. This conversion from pure fiction, from severe fantasy via lavish costumes, clichéd Oriental magick, and RPG-like story-telling, to an unapologetic historical referencing, that of the blacksmith who’s apparently a freed slave (his owner was a Smith making him a black Smith, get it? ), makes it for me a smart move only because of its brazenness, a gall turn to be followed by some garden-variety Buddhist philosophical route our blacksmith decidedly goes through under the wings of a monk after he was rescued from a shipwreck that only he survived. It is then easy to note that The Man with the Iron Fists, like Inglourious Basterds is an exercise on relinquishing history and its baggages through wishful thinking – the blacksmith, the oppressed, finding solace and retribution not through engaging his material condition “realistically” but ultimately projecting this need to overcome his once (perhaps still ongoing) powerlessness through elaborate fantastical circumstances. In the end, regardless of its use (devicing?) of a historical truth, The Man with the Iron Fists isn’t really looking back, unlike the more serious Basterds, but is actually looking forward; with its warring clans, its men as beasts and warriors and women as whores and/or the betrothed who only gets her 15-second screen time to say a fearful farewell to a horse-riding goof, its near constant elaboration of conflict brought about by power and wealth (but, alas, merely as backdrop), it is, and this is its point, envisioning a sort of state wherein we go back to that very condition we thought was already behind us. Honor, courage, and valor are, most certainly, exceptional virtues, but these are, more often than not in real historical sense, met with death; The Man with the Iron Fists on the other hand, as ardently as these virtues are portrayed and waved on the screen by everyone in the cast, they are only quite content that after this showcase, the bullions stay safe and reach their palatial destination. Kadyo is a playwright and a cinephile, and he loves D&D. No, not Dungeons & Dragons. He loves decadence and debauchery.